Address: Avenida Islas Canarias, s/n, Costa Teguise (Lanzarote), Islas Canarias. 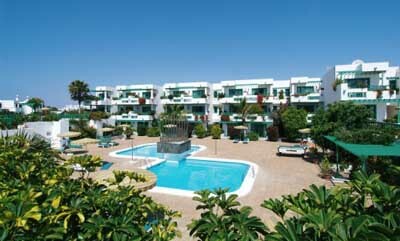 Located 200 metres from Las Cucharas Beach in Lanzarote, Apartamentos Nazaret offers apartments with free Wi-Fi and a communal outdoor swimming pool. Have a relaxing beach holiday at the Apartamentos Nazaret, in a peaceful location of the popular Costa Teguise tourist resort. Apartments are spacious and boast the latest technology, including radio, TV and fully equipped kitchen. After a morning in the sun on your large private terrace, enjoy a cooling dip in the large outdoor swimming pool. The Costa Teguise's beaches are within easy walking distance. You can also head down to the shopping centre just 100 m away, where you will find boutiques, cafés and restaurants. In the evening, you can read in peace in the complex's library. Prepare your own dinner or try the Nazarets delicious restaurant. Free parking at the Nazaret makes it easy to visit the nearby golf courses, and to tour the island. Please inform Nazaret Apartments in advance of your expected arrival time. You can use the Special Requests box when booking, or contact the property directly with the contact details provided in your confirmation. Housekeeping: Apartments are cleaned 5 times a week. Towels are changed 3 times a week, and sheets are changed twice a week.